Want to know what's in the mag this week? Click here! Want to know what’s in the mag this week? Click here! The new issue of Woman’s Own is out in shops now! 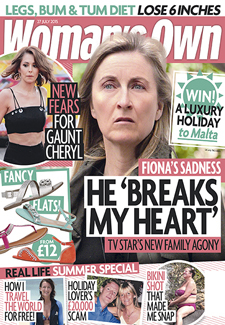 PLUS, remarkable real life stories, discover great value fashion on the high street right now, we look at the celebs expecting this summer, and the fancy, comfortable flats that will get you through the holiday months! We bring you the best way to lose weight off your legs, bum and tum, the easy steps you can take to better health, fresh and fruit recipes for cheap sweet treats and summer desserts, and amazing supermarket deals and new foodie finds in our food news section!